Few people who encounter Ningaloo Reef’s whale sharks (around 12 metres long) deny it is a life-changing event. The best time to swim with these massive softies on the north-west tip of Western Australia (in one of the world’s healthiest reef systems, World Heritage List in 2011), is between April and June. It takes a while to settle into the slow pace but there are few better experiences that help you appreciate the beauty of the Kimberley than a camel ride along Cable Beach. Face to teeth with a Great White (Rodney Fox) off Port Lincoln, SA. 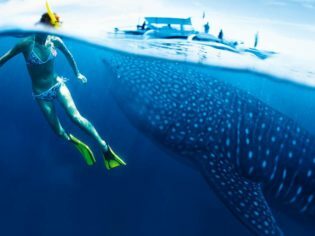 “Even the steeliest of hearts would be floored with the joy and gratitude of this privilege, swimming mere metres from these creatures,” says our editor Georgia Rickard. She went on the three-night ‘Cod Hole’ expedition (which departs Cairns every Monday, dropping you off at Lizard Island, from $1575 per person). Play out the quintessential outback stereotype as you canter your way across the red earth of Kimberley’s Home Valley Station or, at the complete other end of the spectrum, go swimming with a horse as you ride through the gorgeous shallows of Townsville’s Magnetic Island at Horseshoe Bay Ranch (the horses wade chest deep). Sea horses? Riding at Horseshoe Bay, Magnetic Island. It’s almost impossible to guarantee a dolphin encounter anywhere in the world – dolphins swim with you and not the other way around. However, in places such as Western Australia’s Monkey Mia, the odds of connecting with these soulful creatures are greatly increased. Here are five places where the dolphins (in theory) will come to you. Phillip Island is one of the premiere places on the globe to secure a personal penguin experience – and not from far, far away either. Witness the compact creatures groom themselves and interact with each other as they waddle up the beach back to their burrow after a hard day in the ocean (the Ultimate Tour, $84.20 is recommended). Few creatures are as shy as our very own intriguing platypus so seeing one in the wild is an absolute privilege. The mysterious mammal is best spotted in its burrow during the daylight or when it’s on the hunt after dark. Mackay’s Broken River or Adelaide’s Warrawong Earth Sanctuary are two recommended spots for an encounter. Certainly not the cuddliest creatures on the list, but wildlife god Sir David Attenborough once described the mass movement of the red crabs of Christmas Island as “the world’s greatest migration”. And they don’t just frolic on the beach either, marching their way through the forest and the rest of the island too. They’ve not always had the best reputation, but if you want to see Australia’s wild dog in its natural habitat then the concentration on Fraser Island is a must. Catch many dingo glimpses (from afar) on Fraser Island.